While staying safe on the job is always a priority, now that winter is in full force, being prepared and dressing appropriately is critical. Here are some cold weather safety tips. While staying safe on the job is always a priority, now that winter is in full force, being prepared and dressing appropriately is critical, as injuries or illnesses during the colder months could quickly become fatal. If you’re a seasoned outdoor worker, you know that layering is the most effective way to beat the cold and stay safe in all kinds of weather. Layering can also be wise throughout the day when the temperature fluctuates, as you can always take off or add a layer. When thinking about cold weather safety tips and what kinds of clothes are optimal for layering, it’s helpful to think of three basic layers. 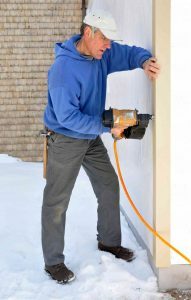 For your base layer of work clothes, you want to be able to retain your body heat without losing heat due to sweating. To combat the moisture, you should pick a quick-wicking material that can soak up the moisture while still maintaining its thermal capabilities. Great fabrics are wool, silk, natural fibers, and synthetic fabrics, like polypropylene, which are found in thermal underwear. Avoid cotton and down in this layer, as cotton isn’t very thermal and traps moisture, and down is only good for staying warm when it doesn’t get wet, which is the main concern at this level. The middle layer should trap the warm air close to your body, and animal fibers like wool, silk, down, and synthetic fleece are great options. With this layer, it’s wise to avoid anything tight-fitting or cotton again. Anything that is too tight will restrict your circulation and can make your limbs colder, as the blood flow to your hands, fingers, feet, and toes becomes limited. Make sure these parts have insulation too. Gloves with a thin fleece lining and non-slip palms and synthetic or animal fiber socks are effective in retaining heat in your extremities. Our last piece of advice when it comes to cold weather safety tips involves wind protection. For your outer layer, wind is the main priority, along with considering other weather protection measures. Strong winds can lead to frostbite or hypothermia, so your outer layer should be windproof and water resistant. Jackets with the ability to ventilate are also fantastic, as weather fluctuates throughout the day and that will help avoid overheating while you’re working. Avoid loose garments or accessories like scarves, or hats with straps, etc. as they can get caught in machinery. Instead, opt for a stretch cap that covers your ears and neck as well, whether it’s your main hat or something you can wear under a hard hat, a lot of heat can escape from the head, so it’s important to preserve that heat too. This entry was posted on Friday, December 15th, 2017	at 10:18 am	. Both comments and pings are currently closed.